Southfield, Michigan - Activists hold a "Guns Out & Jobs In" vigil at the Church of St. Bede, opposing a plan to tear down the church to build a Walmart store. They noted that Walmart is the biggest gun distributor in America, and that the retailer's jobs pay less than a living wage. The church has been vacant since the Archdiocese of Detroit merged four Catholic churches in 2007. 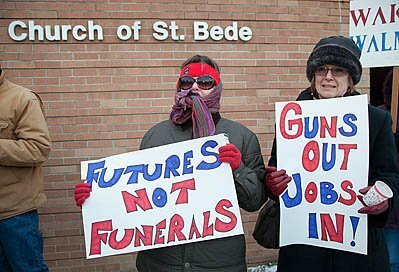 Image Description: Southfield, Michigan - Activists hold a "Guns Out & Jobs In" vigil at the Church of St. Bede, opposing a plan to tear down the church to build a Walmart store. They noted that Walmart is the biggest gun distributor in America, and that the retailer's jobs pay less than a living wage. The church has been vacant since the Archdiocese of Detroit merged four Catholic churches in 2007.